As you all know the Annual Oscar ceremony is one of the most prestigious nights in Hollywood and broadcast worldwide. The 79th annual will be held at the famous Kodak Theater on the Feb 25th 2007. Like each year we will see an army of nominees in competition in 24 different categories. If the best director, film, actor and actress categories are sure to draw most of every movie buff’s adrenaline, it should be noted that the Academy also awards many of the unknown talents that contribute to the Art and who are most often behind the scenes in post production for Visual Effects, Costume Design, Music Score, Screenplay or Sound Edition to name a few. 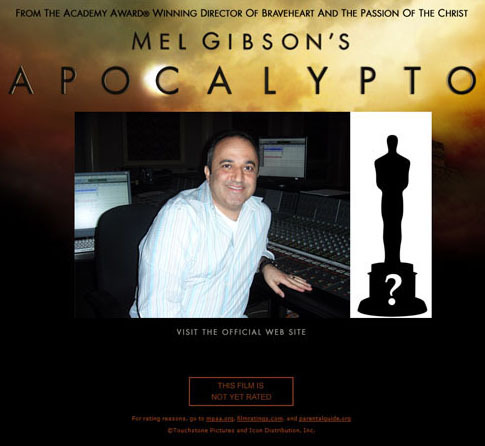 This year the Iranian Community is once again being honored thanks to the superb work done on Mel Gibson’s Apocalypto by Sound Engineer Kami Asgar who has been nominated for best Sound Edition along with colleague Sean McCormack. The movie was co-produced by another Iranian compatriot Farhad Safinia who also co-wrote the script with Gibson. Interestingly Kami Asgar had worked with Gibson on the controversial epic The Passion of the Christ but also with fellow Iranian Kayvan Mashayekh on The Keeper: The Legend of Omar Khayyam. Last time another compatriot was nominated for an Oscar it was Shohreh Aghdashloo for best supporting role in a House of Sand and Fog in 2003. The competition will nevertheless be tough with four other nominees: Blood Diamond, Flags of Our Father’s and Letters from Iow Jima as well as Pirates of the Caribbean: Dead Man’s Chest. But let’s keep our Fingers crossed for our national Asgar Jan and stay tuned for an exclusive interview with him in the near future. About the Author: Darius KADIVAR is a Freelance Journalist, Film Historian and Media Consultant. He lives and works in France.